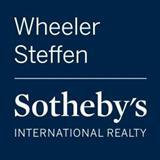 Courtesy Of GEOFFREY HAMILL, WHEELER STEFFEN SOTHEBY'S INT. MAGNIFICENT SPANISH MEDITERRANEAN ESTATE. Perfectly located in Ontario's prestigious Historic Armsley Square, a picturesque 40 foot wide street among an arching canopy of 35 foot tall camphor trees and stately vintage custom homes. Quality built circa 1927, and designed by Architects Edwin C. Thorne and Peter Ficker, this quality custom home features numerous original architectural elements and many tasteful renovations throughout. 4 bedrooms + Library or 5 potential bedrooms. Home enjoys Philippine Mahogany woodwork and dramatic 12 foot ceilings. Upgraded kitchen includes a sunny breakfast nook. Redwood balconies and exterior trim. 4-car garage. Spacious deep lot of over 1/4 acre. Backyard features an expansive lawn area plus a Grecian style Pool and Spa. Possible Mills Act tax savings, please check with city for details. A truly stunning property that is seldom on the market for sale!